The pearl of the Orient. The whore of the Orient. Depending on the individual, Shanghai can conjure up a lot of different images for people who have never stepped foot here. For most Westerners, this city offers a mix of opulence and opportunity, exotic experiences and culture shock. Most importantly, Shanghai is the commercial vanguard of China’s sprint into the 21st-century. Once upon a time, multinational companies had to offer lucrative compensation packages for their employees to move to the ‘3rd-world’ region of Shanghai. This city has long since cast off the undeserved reputation of an undeveloped environment. Indeed, Shanghai has become one of the most sought-after destinations for those with dollars in their eyes and adventure in their hearts. Entire industries have sprung up to provide luxury living to Shanghai’s 130,000+ foreigners, offering everything from spa resorts and yacht clubs to lavish lounges and the trendiest boutiques. Life in Shanghai can be rich, fulfilling and completely unique. However, a comfortable lifestyle requires preparation and knowledge. Dirt-cheap dumplings (jiaozi for those living here) can be a great snack right after touching down in Shanghai, but there comes a time when many foreigners start craving the cuisine of home. While the skyscrapers here can be breathtaking at first glance, they can become claustrophobic at the 100th glance, making the city’s green parks a welcome respite. 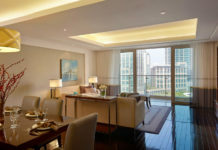 Likewise, this city offers a wide range of luxury villas and fully-serviced apartments for wealthier foreigners. However, many are located in areas which may not be ideal for certain lifestyles and certain demographics. It can be tough enough adjusting to the drastically different culture and language after touching down. Fortunately, there are professional relocation agencies that can help you find a home, process your visa and even find the perfect international school for your kids. However, a truly luxurious lifestyle requires knowledge: for example, of where the best spa’s and boutiques are, of where you can go to get away from the frantic energy of Shanghai’s urban sprawl, of what each serviced apartment complex offers. This section is for readers thinking of, or preparing to, move to Shanghai. Luxury Living in Shanghai will act as a guide for those readers who want to continue their luxurious lifestyle in this city.